To learn more about this winery, that will be based out of Kansas by November of 2018, check out my review of their 2016 Chardonnay. I suggest you do that anyways because that Chard is pretty awesome. Doooo iiiiit. Go ahead, reeeeeeeead it. Here's the link again. Like their Chardonnay, I know very little about the winemaking process. I do know that it was fermented in stainless steel and aged in French oak barrels for eleven months. And that the ABV is 13.8%. So with that said, it seems like a perfect time to talk about the music I'm listening to while reviewing this wine. Today's music selection is one of the most iconic sountracks of the 1990's: Demon Knight. As a kid I loved Tales from the Crypt. I watched the show, I read the comic books. Hell, I still have the comic books and will still open one up every once in awhile. 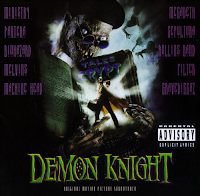 The show made a movie in 1995 called "Demon Knight" and it was amazing for a fifteen year old like myself, buuuuuut... it really doesn't hold up at all. The soundtrack, however, will hold up for eternity. It starts off with Pantera's Cemetery Gates, which is just incredible. Ministry's Tonight We Murder pops into my head all the time. Then there's Machine Head, Megadeth, Melvins, Rollins Band, Biohazard, and Sepultra. It's a metal eargasm. The song that launched Filter's popularity, Hey Man Nice Shot, made its big debut on this album and opened the movie. And how can you forget Gravediggaz, basically a Wu-Tang Clan spinoff, and their song 1-800-Suicide. So yeah, this wine is seeing some headbanging action tonight. Now let's drink some wine! On the pour you can immediately tell what kind of Pinot Noir this is going to be. It's garnet in color but so light in clarity that I could hold the glass up to the computer screen and read what I'm typing through the wine. This ain't gonna be California juicy-juice. 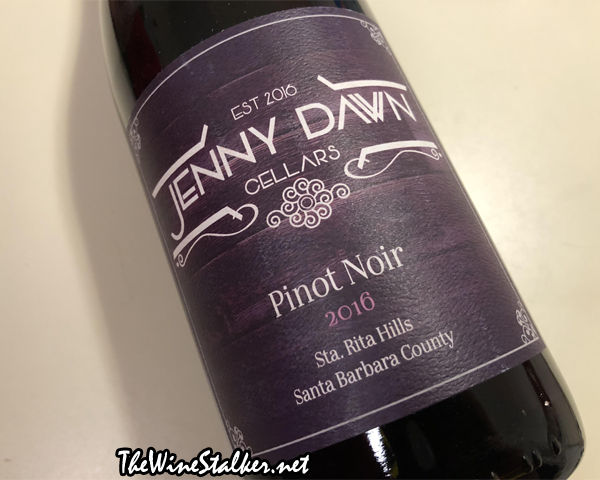 This is legit cool climate Pinot Noir. And the nose just verifies that. There's aromas of dirt, dried tobacco, copper, burnt plastic, raspberries, chocolate, and mint. Man, oh man. I friggin' love the smell of this wine. It's light to medium bodied with perky acidity, and with a slick mouthfeel but grainy tannin. There's flavors of cherries, raspberries, copper, chocolate, and tea. Then it finishes with raspberries and a very long lasting mintiness. One thing I gotta tell you is you have to let this sucker open up. It was very tight at first and not too pleasant, so do what you do to let it breath. Once you've done that, this wine is golden. I don't take $50 wines lightly because we need that money to buy diapers, but I absolutely recommend this one! Again, Wichita is about to have some crazy good wine!